One of our projects, Project Baseline, was highlighted in the journal Science! This NSF-funded multi-collaborator project will entail collecting seeds of key species throughout North America in a way that will allow the use of ancestor-descendant comparisons (Franks et al. 2008) to investigate evolution in natural populations in response to ongoing changes in climate. Click [Here] to view the article! In our lab, we study plant ecological genetics. 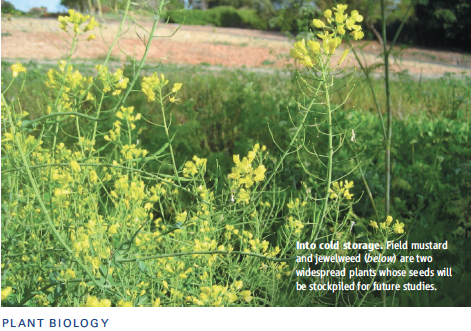 Research topics include evolutionary responses to climate change, evolution in invasive species, plant reproductive ecology, and the genetic basis of evolutionary changes in drought response and flowering time. We have funding from the National Science Foundation for Project Baseline- a plan to collect seeds of key species from natural populations to examine future evolutionary responses to climate change. Click on the tabs above for more info about us and our research. Prospective graduate students are welcome to contact me (see ‘Contact’ tab above).